First, a stampede of dinos! Run, they’re comin’ atcha! Scroll down for the second video – watercolor! 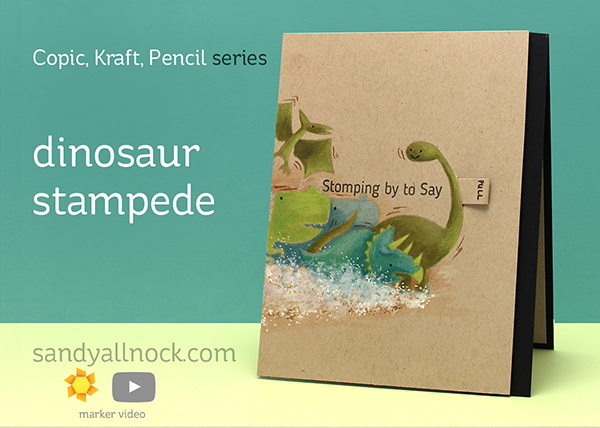 We all need cards that work for guys – and dinosaurs are great for those! 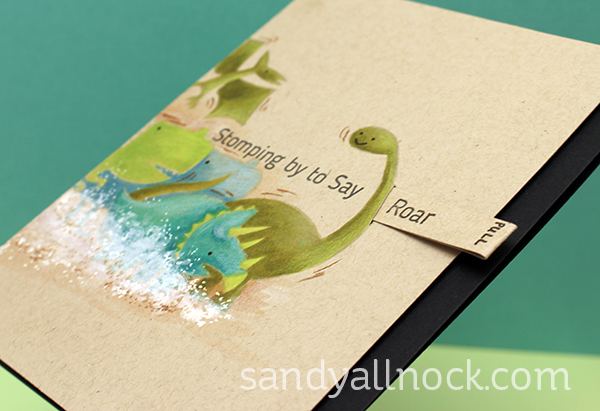 I wanted to use the “Stomping By To Say Hello” sentiment on this card, but wanted to emphasize the stomping. I did that by adding a cloud of dust, some motion lines – and changing the sentiment up a little bit! Watch the video below or click HERE to see it in HD on YouTube. If you’d like to keep up with these Copic + Pencil + Kraft posts, I created a gallery HERE! 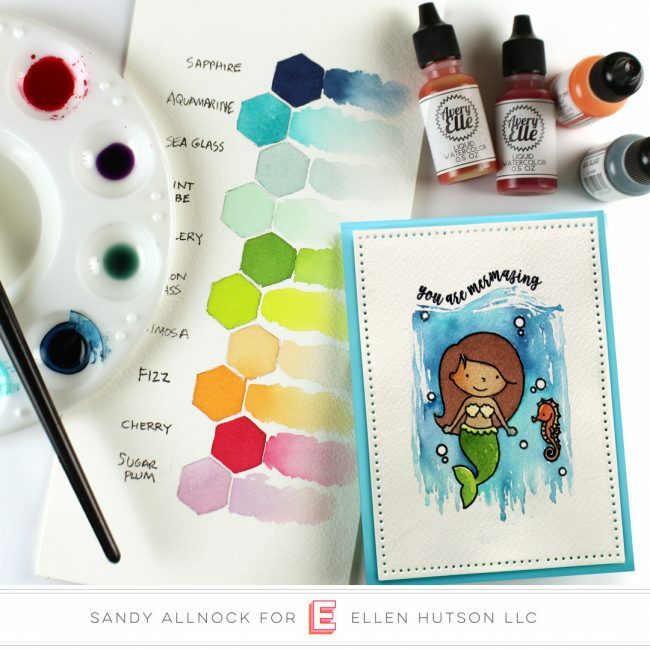 The promised video is over at Ellen Hutson today – showing you how to create brown colors for skin and hair from the Avery Elle watercolors (or any watercolors you own!) to paint this sweet Mermaid. Head over to Ellen’s blog – Go see now! The dinosaur card is so cute. I have a grandson that loves dinosaurs and he would love a card like this! I often wonder how you come up with solutions to problems like running – the dust cloud &how you created it was brilliant. I learn something new everytime I watch your videos which I do every chance I get. Thank you for ideas and inspiration. I love this Dinosaur card, it remind me of the gorgeous safari gang you did last year. Great that you show how to get movement in an image. Thanks Sandy! Thanks for this GREAT video! I love everything about this card! Wonderful tips and card Sandy…thank you!!!! Cute idea. Love the pull tab. So much great info packed into your videos, I ♥ it. TFS! Love this! The dinosaurs, the colors, the ideas for doing no-line stamping, the dust cloud… I never would’ve thought to use colored pencils over Copic inks… Great tutorial. I also appreciate the admonition to make a card and actually SEND it! You know us, don’t you?! When we make something fresh and new and just about perfect… how can we part with it?! But I’ll try….